Tanjung Puting is one of the natural wonders of the world. You may not believe this after you have been there only two days or three days, but after the fourth or fifth day something happens. 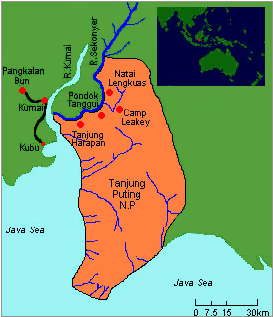 The peat swamp and fresh water swamp forest associations present in Tanjung Puting were at one time extensive along the south coast of Borneo from Banjarmasin in the east to the Kapuas River near Pontianak in the west. These swamps extended up the northwest coast of Sarawak and Brunei and as far as the Klias peninsula in Sabah. In Sarawak in general, peat swamp forests are very well developed and they are still very important there as a natural resource. In Kalimantan, however, much of the swamp habitat has been converted, both permanently and on shifting cultivation basis, to rice fields. Swamp habitats, as found in Tanjung Puting, are becoming more difficult to find. Although Tanjung Puting has suffered some encroachment from human activity, the Park area is still wild and pristine. The vegetation supports a large population of animals, making this one of the most important areas in Southeast Asia for the preservation primates, birds, reptiles and fish.